As the old saying goes, “a picture is worth a thousand words.” Using tools like swim lane diagrams and value stream maps can provide a comprehensive view of the what, when, and who of the process. The picture of the process also provides an easy mechanism to communicate the current state to other stakeholders (especially executives). Once you have a clear picture of the process, it is now time to determine the breakdowns. It’s impossible to solve a problem if you don’t know what’s causing it. 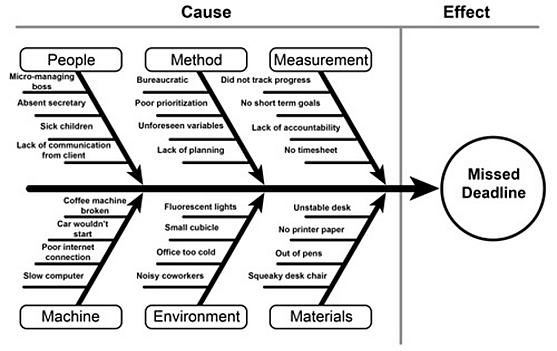 A fishbone (or Ishikawa) diagram is an additional tool that can be used to help map out where the root cause lies. If the process is inefficient or not being followed but is still ultimately delivering the intended outcomes, then the current process can remain in place. It just needs to be tweaked to achieve the desired results. This is where a Lean Approach can really be beneficial in tweaking the processes to drive out inefficiencies. If the process is not delivering the desired outcome, then making that process more efficient will only get you the wrong outcome faster. In this scenario, it is time to go back to the drawing board and completely redesign the process using lessons learned from the previous process. Once the cause is determined and the methods for fixing them have been planned, it’s time to make the changes and integrate the new processes into your operating model. The key to making this step a success is good communication to those impacted and keeping them engaged. When it comes to having a good process in place, there is never a finish line. Business environments are constantly evolving (e.g. new product lines, new leadership, change in technology, etc.) making it essential to regularly review and update your processes to avoid breaking them again.